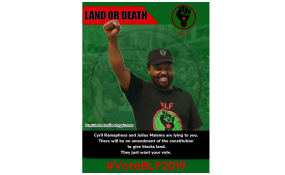 The BLF has called on the "landless to take all necessary steps to reclaim their land without paying for it". The DA says it has reported Black First Land First (BLF) leader Andile Mngxitama to the South African Human Rights Commission (SAHRC) and taken him to the Equality Court for comments he made over the weekend which "incites violence" against white South Africans. In a statement, DA national spokesperson Solly Malatsi said the party's North West leader, Joe McGluwa, will also lay charges against Mngxitima for incitement of violence. "We cannot allow Mngxitama's comments and actions to go unchallenged," Malatsi said. "Institutions of the state empowered to investigate and prosecute on matters of this nature have a duty to act." During his speech in Potchefstroom over the weekend, Mngxitama reportedly urged an audience to kill five white people for every one black person that dies because of taxi violence. Malatsi said Mngxitama's behaviour was "undoubtedly a trend characteristic of the BLF, as is clearly evident based on their track record over the past two years". The SAHRC was not immediately available for comment. Meanwhile, trade union Solidarity said it would approach the Independent Electoral Commission (IEC) to file a complaint against Mngxitama to stop his party from participating in next year's elections. Solidarity said in a statement that "Section 16(1)(c) of the Electoral Commission Act makes it clear that the chief electoral officer may not register a party if such party is guilty of the incitement of violence or discrimination in accordance with generally accepted grounds". "No political leader that announces with pride on a stage that people will be murdered should be allowed in a position of power where he can perform these actions. A party seeking a mandate of murder, mustn't be allowed to participate in democracy," said Solidarity Research Institute head Connie Mulder. "Despite the fact that Mngxitama's pronouncements are becoming more radical, BLF is still invited to participate in the parliamentary debate about land expropriation. "This causes an offensive ideologue to be regarded as a reasonable voice in South Africa's ideology, which is a disgrace. "There should be a realisation that there are consequences to your actions. We aren't asking for special attention for some people, but merely that you should be held accountable for your actions." When asked for comment, Mngxitama told News24 that he would clarify his comments during a media briefing at their Johannesburg offices on Tuesday. "There is a lot of confusion. We are not giving anymore comment on this matter until tomorrow (Tuesday). We are going to clarify the comments and also further steps which includes our engagement with the Zimbabwe military war veterans," he said.